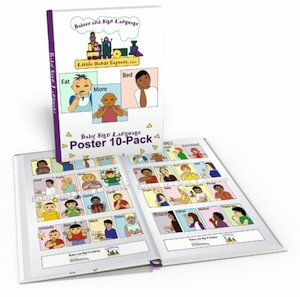 Baby Sign Language - Should I Use ASL Or Home Signs? Should I Use ASL Or Home Signs? Two main pioneers in the application of American Sign Language for babies advocate different sign style approaches. American Sign Language is a form handshapes, hand motions, gestures, and facial expressions, that convey concepts in language as a form of communication. 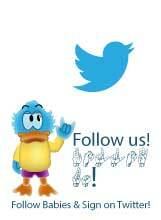 American Sign Language (ASL) does not follow the same grammatical properties of English. (Same as for most languages.) When Deaf people communicate through sign language, we can convey even the most abstract meanings and human emotions through signs and facial expression. ASL is flexible and not difficult for babies to learn. From this language base came the majority agreement for using American Sign Language for babies. Joseph Garcia (a hearing offspring of Deaf parents) believes babies should be taught American Sign Language as it is true and formally recognized language. In other words, parents will probably want to use standard sign language as the American Sign Language for babies. Linda Acredolo promotes the use of home signs particular to an infant and family. Ms. Acredolo believes infants and parents should be encouraged to make their own signs. Naturally there are advantages to both approaches. By encouraging the development of unique signs and gestures as proposed by researcher Acredolo, a child uses creativity. The use of creativity can impact learning skills in all areas including language. Using family designed home gestures also can increase family bonding. It is like having secret codes that mean something special. 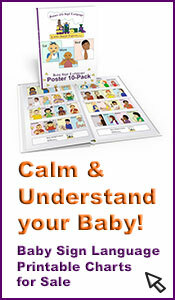 Anyone who will be involved in the infants life can share in the home signs. 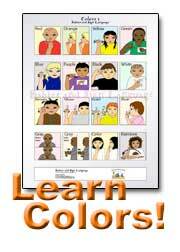 With American Sign Language for babies, the language is composed of both American Sign Language and a few home signs. ASL is a language in every sense of the word. There are universities (and even high schools!) that offer American Sign Language as a credit class in foreign languages. Knowing how to use ASL can lead to becoming bilingual. Research has proven that after you maser a second language, the third and fourth languages are easier to learn. That is because you learn to think outside single language concepts. 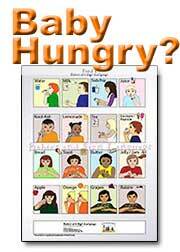 This develops brain cognitive skills required to learn languages. There is another major benefit to using formal American Sign Language for babies. Children who maintain the language skills throughout their school years can use the language abilities in employment. People who know how to sign are always in demand. For instance, sign language interpreters are high in demand and the pay is (often) absolutely fabulous. Of course, no matter which sign language style you decide to use, infants will have a few signs they create on their own. No need to discourage this cleverness! These home signs can supplement the standard American Sign Language format. It is important to not discourage creativity and limit learning in a child. The important point is that American Sign Language for babies is only beneficial and teaches a language that can be used for a lifetime. "Hi, I just wanted to make a comment on your 'which sign style' page. How do I learn signs for my baby? How can I explain to others why we've chosen baby signing? Are there anything signing benefits for my toddler? Question about babies and sign language? Contact Me!